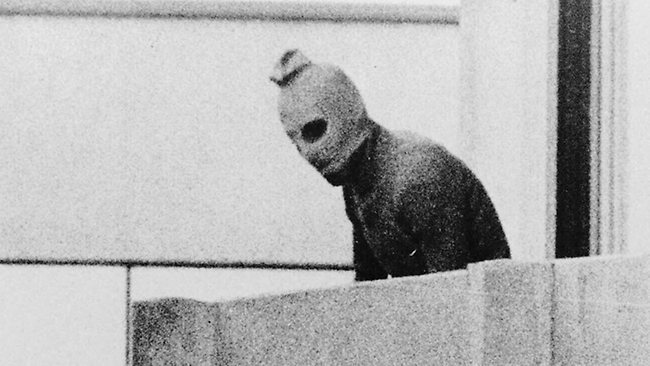 Black September gunman, Munich Olympic village, 1972. One of the points that I try to impress upon my students when I teach my course on terrorism is that, as a form of political action, terrorism has been around for far longer than our current post-9/11 awareness would lead most Americans to acknowledge. First, there is an automatic tilt toward recounting incidents targeting either the United States, US citizens, or US allies. Second, there is a tendency to focus on incidents perpetrated by groups whose ideologies and motivations are seen as currently threatening to the United States, or by groups that have some kind of historical connection to present security challenges facing the US. Together, these first two biases mean that there is an overrepresentation on the calendar of post-9/11 attacks perpetrated by groups espousing an Islamist ideology. Third, there is a tendency to emphasize acts of transnational terrorism targeting the US or US interests over acts of domestic terrorism within the United States that lack some sort of transnational link, either ideological or material. This despite the reality that the vast majority of terrorist incidents the United States has suffered historically, and the primary threat of terrorism confronting the US today, comes from domestic groups, mainly but not exclusively, on the far right of the political spectrum. Despite all these caveats, there is value in keeping in mind the reality that as much as Americans might think that terrorism is a new phenomenon, or tend to see ourselves as uniquely at risk, terrorism has been with us for a very long time, and there are countries that have faced far worse than we face today. Sept. 4 — 2007, Denmark: Police in Copenhagen arrest eight al Qaeda-linked individuals accused of plotting terrorist attacks. Sept. 5 — 1972, West Germany: Israeli athletes at the Munich Olympics are held hostage by Black September; 11 are killed on Sept. 6 in a failed rescue attempt. Sept. 6 — 1986, Turkey: Abu Nidal Organization (ANO) kills 21 in an attack on an Istanbul synagogue. Sept. 7 — 1995, France: Car bomb explodes outside a Jewish school in Lyon, wounding 14; Armed Islamic Group (GIA) of Algeria is suspected. Sept. 8 — 1999, Russia: Bombing of apartment building in Moscow kills 94; Dagestan Liberation Army claims responsibility. Sept. 9 — 1969, Northern Ireland: The government announces that the British Army will build the first “peace line” in Belfast separating Protestant and Catholic areas in an effort to prevent rioting. Sept. 10 — 2001, Colombia: German Briceno, leader of the Revolutionary Armed Forces of Colombia (FARC) is sentenced in absentia to 40 years in prison for the killing of three Americans.